The term subclavian steal describes retrograde blood flow in the vertebral artery associated with proximal ipsilateral subclavian artery stenosis or occlusion, usually in the setting of subclavian artery occlusion or stenosis proximal to the origin of the vertebral artery. Alternatively, innominate artery disease has also been associated with retrograde flow in the ipsilateral vertebral artery, particularly where the subclavian artery origin is involved. Treatment has traditionally consisted of open subclavian artery revascularization, typically via carotid-subclavian bypass or subclavian artery transposition, which are generally durable procedures. Newer, less invasive options include endovascular intervention with recanalization as appropriate and angioplasty and stenting if required. 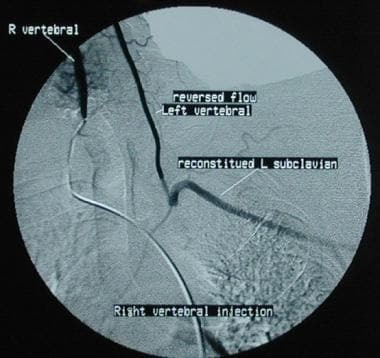 The clinical relevance of subclavian steal was described in 1961 by Reivich, Holling and Roberts; however, the recognition of retrograde vertebral artery flow dates back another 100 years to Harrison and Smyth. 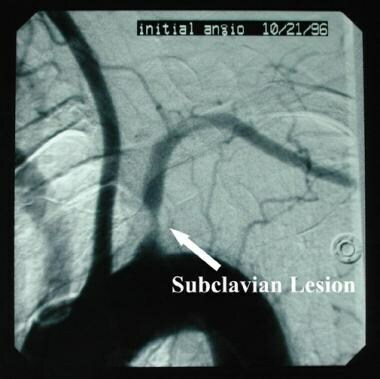 Some papers, including a previous version of this article, advocated restricting the term subclavian steal to patients with neurologic symptoms only, but this is incorrect in view of the substantial literature using this term to describe the hemodynamic scenario of retrograde vertebral flow and proximal subclavian artery disease. The upper limb is supplied primarily via the axillary artery, the continuation of the subclavian artery that exits the thoracic outlet. On the right, the common carotid artery and the subclavian artery share a common trunk, commonly known, perplexingly, as the innominate (ie, nameless) artery but also referred to as the brachiocephalic artery or trunk. In some congenital anomalies, the right subclavian artery may arise directly from the aorta as the last supra-aortic trunk (known as an aberrant right subclavian artery), or it may be isolated. On the left, the subclavian artery typically arises directly from the aorta as the last supra-aortic trunk. Described branches from the subclavian arteries from proximal to distal include the vertebral arteries, the internal mammary artery (IMA; also known as the internal thoracic artery), the thyrocervical trunk, and the costocervical trunk before it becomes the axillary artery. In the setting of severe proximal subclavian artery stenosis or occlusion, typically due to atherosclerotic disease, insufficient flow may be present to sustain the ipsilateral arm. In this case, the branches of the subclavian artery may be recruited to provide collateral retrograde flow to the upper limb. For example, the IMA provides anastomoses to the superior epigastric and intercostal arteries. The thoracoacromial trunk anastomoses with vessels in the neck and thoracic wall. Of greatest relevance for present purposes are the confluence of the vertebral arteries at the basilar artery and its subsequent communication with the circle of Willis, which allow the ipsilateral vertebral artery to provide flow in a retrograde manner (see the image below) from the contralateral vertebral artery or from the anterior cerebral circulation. Retrograde blood flow from left vertebral artery into left subclavian artery in patient with subclavian steal syndrome. With exercise, innate and metabolite-induced vasodilatation leads to a drop in peripheral resistance in upper-limb vessels, and the mismatch between arterial inflow and metabolic demand may lead to claudication of the arm. Furthermore, increased retrograde flow through the ipsilateral vertebral artery may “steal” blood away from the cerebral circulation. This may be more likely if there is concomitant stenotic disease of the other extracranial or intracranial vessels. With the increasing use of the left IMA (LIMA) as a conduit for coronary artery bypass grafting (CABG), a phenomenon often referred to as coronary subclavian steal has become recognised. Where proximal subclavian artery disease develops or progresses in the setting of previous LIMA graft coronary bypass, the LIMA graft may become reliant upon the retrograde vertebral flow. Exercise of the upper limb may result in diversion of flow from the LIMA graft into the arm, resulting in myocardial ischemia or angina. The underlying factor leading to subclavian steal is proximal subclavian artery occlusion or severe stenosis. In most cases, this is a result of atherosclerotic arterial disease, which has a preponderance for the left side. On the right side, innominate artery disease or occlusion may result in occlusion of the subclavian artery origin. Although retrograde blood flow in the vertebral artery is usually noted angiographically in association with proximal ipsilateral subclavian artery occlusion, subclavian steal may also occur with hemodynamically significant subclavian artery stenosis (see the image below). Other, less common causes of subclavian occlusive disease include inflammatory arteriopathies such as Takayasu arteritis or giant cell arteritis. Congenital anomalies may also result in isolation of the subclavian artery and sacrifice of the proximal subclavian artery in aortic surgery (eg, a Blalock-Taussig procedure for tetralogy of Fallot or coverage of the left subclavian origin with a thoracic endovascular stent graft). Thoracic outlet compression syndrome can cause subclavian artery occlusion, but this typically involves the subclavian artery beyond the vertebral artery origin. The left subclavian artery is the aortic arch branch vessel most commonly affected by atherosclerosis; therefore, it is not surprising that the left subclavian artery is involved with subclavian steal three times more frequently than the right subclavian artery is. Patients with asymptomatic flow reversal in a vertebral artery have a benign natural history, and no specific treatment is required. With proximal subclavian artery occlusive disease, patients may first seek medical treatment for symptoms of exercise-induced arm claudication rather than for neurologic symptoms associated with arm exercise. Furthermore, if a patient has undergone coronary revascularization with a LIMA graft, new-onset angina may herald proximal left subclavian stenosis. With subclavian steal syndrome, if neurologic symptoms do occur, they tend to be transient (eg, hypoperfusive transient ischemic attack) and seldom lead to stroke. For patients in whom antegrade vertebral blood flow is reestablished by means of either surgical revascularization or endovascular stenting of the diseased subclavian artery, the prognosis is highly favorable. The stroke risk from the procedure is low, and the long-term durability is excellent. Operative morbidity and mortality are substantially higher for transthoracic subclavian artery revascularization than for extrathoracic repair, mainly because of the morbidity associated with thoracotomy. Recognizing this problem, surgeons have virtually abandoned this approach in favor of extrathoracic revascularization in the form of either carotid-subclavian bypass or subclavian transposition. Operative mortality for either of these extrathoracic procedures approaches zero, and morbidity is very low. The results of retrograde (brachial puncture) or antegrade (femoral puncture) percutaneous subclavian angioplasty or stent placement are also excellent. Most authors report initial success rates of 91-100%, and the complication rate is reasonably low (3-17%). After successful stenting of the subclavian artery, the restenosis rate is 0-16% after 12-48 months’ follow-up. The technical success rate of subclavian angioplasty ranges from 86% to 100%. The restenosis rate after subclavian angioplasty is 5-22% after 28-60 months’ follow-up. Sharma VK, Chuah B, Teoh HL, Chan BP, Sinha AK, Robless PA. Chronic brainstem ischemia in subclavian steal syndrome. J Clin Neurosci. 2010 Oct. 17 (10):1339-41. [Medline]. Nicholls SC, Koutlas TC, Strandness DE. Clinical significance of retrograde flow in the vertebral artery. Ann Vasc Surg. 1991 Jul. 5 (4):331-6. [Medline]. Labropoulos N, Nandivada P, Bekelis K. Prevalence and impact of the subclavian steal syndrome. Ann Surg. 2010 Jul. 252 (1):166-70. [Medline]. Fields WS, Lemak NA. Joint Study of extracranial arterial occlusion. VII. Subclavian steal--a review of 168 cases. JAMA. 1972 Nov 27. 222 (9):1139-43. [Medline]. Berguer R, Higgins R, Nelson R. Noninvasive diagnosis of reversal of vertebral-artery blood flow. N Engl J Med. 1980 Jun 12. 302 (24):1349-51. [Medline]. Wrotniak L, Kabłak-Ziembicka A, Rosławiecka A, Musiałek P, Bogacki P, Trystuła M, et al. Resolution of ischemic symptoms after percutaneous angioplasty for a symptomatic subclavian artery stenosis. J Vasc Surg. 2016 Sep. 64 (3):684-91. [Medline]. Potter BJ, Pinto DS. Subclavian steal syndrome. Circulation. 2014 Jun 3. 129 (22):2320-3. [Medline]. Moghazy KM. Value of color Doppler sonography in the assessment of hemodialysis access dysfunction. Saudi J Kidney Dis Transpl. 2009 Jan. 20 (1):35-43. [Medline]. Ziomek S, Quiñones-Baldrich WJ, Busuttil RW, Baker JD, Machleder HI, Moore WS. The superiority of synthetic arterial grafts over autologous veins in carotid-subclavian bypass. J Vasc Surg. 1986 Jan. 3 (1):140-5. [Medline]. Chatterjee S, Nerella N, Chakravarty S, Shani J. Angioplasty alone versus angioplasty and stenting for subclavian artery stenosis--a systematic review and meta-analysis. Am J Ther. 2013 Sep-Oct. 20 (5):520-3. [Medline]. Song L, Zhang J, Li J, Gu Y, Yu H, Chen B, et al. Endovascular stenting vs. extrathoracic surgical bypass for symptomatic subclavian steal syndrome. J Endovasc Ther. 2012 Feb. 19 (1):44-51. [Medline]. Satti SR, Golwala SN, Vance AZ, Tuerff SN. Subclavian steal: Endovascular treatment of total occlusions of the subclavian artery using a retrograde transradial subintimal approach. Interv Neuroradiol. 2016 Jun. 22 (3):340-8. [Medline]. Successful stent treatment of subclavian stenosis, with restored antegrade flow into vertebral artery.